Welcome to TROMAVILLE, NEW JERSEY – a small American town, terrorized by criminals. The town’s corrupt mayor sits idly by, while muggers, robbers and teenage punks victimize helpless citizens. Among the residents of Tromaville is MELVIN, a nerdy emaciated janitor at the local health club. That is, until he becomes THE TOXIC AVENGER! A gang of thugs devise a cruel hoax that goes horribly wrong as Melvin is cast through a third story window into a vat of hazardous toxic waste. However, an unexpected metamorphosis takes place. 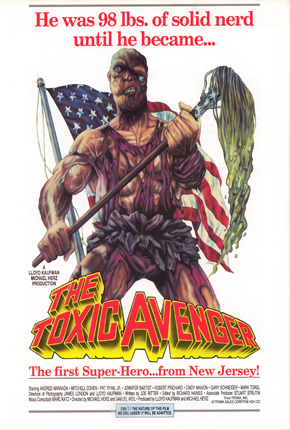 As the chemicals take hold of his body, Melvin turns into the TOXIC AVENGER, doer of good, and brutal mauler of evil! The rest, as they say, is history! The excitement is non-stop as the hero sets out to single handedly wipe out the forces of evil that torment the people of Tromaville. THE TOXIC AVENGER is non-stop entertainment that will leave the viewers glowing from the fun. See the film that spawned the comic book, website, cartoon, action figures and three sequels to date! 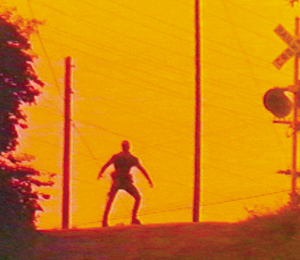 Experience the action that made Troma Entertainment a cinematic legend! Still a classic three decades later! See THE TOXIC AVENGER!